All life exists on a knife’s edge, a delicate balance of the many thousands of biochemical reactions that sustain it. At the cellular level, life is nothing but the proper collection of such chemical processes, all playing out in carefully choreographed sequence, like a well-rehearsed ballet. But every organism has one big problem: left to their own devices, the chemical reactions necessary for life behave less like practiced dancers and more like an unruly mob. Some reactions proceed with reckless abandon, others unfold slowly, and still many more would never occur at all in the span of human lifetime. This is where enzymes step in. Enzymes are a class of proteins — large, folded-up molecules — that work to accelerate specific chemical interactions. Within the body, it is up to enzymes to make the reactions run on time. In one extreme example, researchers have determined that a kind of reaction involving molecules called phosphate monoesters would take more than a trillion years to occur on its own. But thanks to an enzyme, it happens in our cells almost 100 times every second. An enzyme speeds up biochemical reactions by lowering the energy needed for them to occur. Image courtesy of Nature Education. The role of enzymes in reconciling disparate time scales in living organisms makes them an important subject of scientific study. Among those interested in the study of enzymes is Yale University’s Corey Wilson, Assistant Professor of Chemical and Environmental Engineering. Wilson’s research group has focused on exploring the connections between how enzymes work and the temperatures at which they function. Corey Wilson, Assistant Professor of Chemical & Environmental Engineering, Biomedical Engineering, and Molecular Biophysics & Biochemistry. Image courtesy of the Yale School of Engineering and Applied Science. Wilson and his team have worked to understand what determines this “Goldilocks” window for each enzyme. So far, their research has allowed them to successfully create designer proteins that function best at a specific, pre-determined temperature. Their work, published this year in the journal Structure, introduces a new range of possibilities for understanding and manipulating the so-called “thermostability” of enzymes. 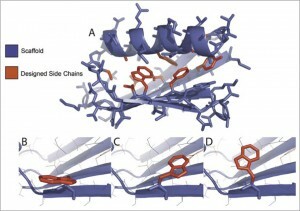 The team began by modeling protein structures using pre-existing techniques, which do not take temperature into account. They then compared the results of these computer models with experimental data. The gap between model and reality allowed them to elucidate the role played by temperature. Using this new information about enzyme function at different temperatures, Wilson and his team could “rationally design” enzymes that work optimally at temperatures of their choosing. Wilson’s research group designs new enzymes by manipulating the shape of the protein scaffold and the functional side chains that are attached. Image courtesy of Biotechniques.com.